Just a quick post to show a full photo of, "Northern Wilderness." I need a teenage boy to help me figure out my computers! I am struggling with a few issues but I will muddle through it. I need to get a photo editing program for my PC...any suggestions? I really only know about Adobe photoshop but I haven't used it in many years. I need something simple! Yesterday, Wednesday, I spent the whole day thinking it was Thursday...really! That night, while talking to hubby I realized my mistake so today is like a bonus day...maybe like a snow day! 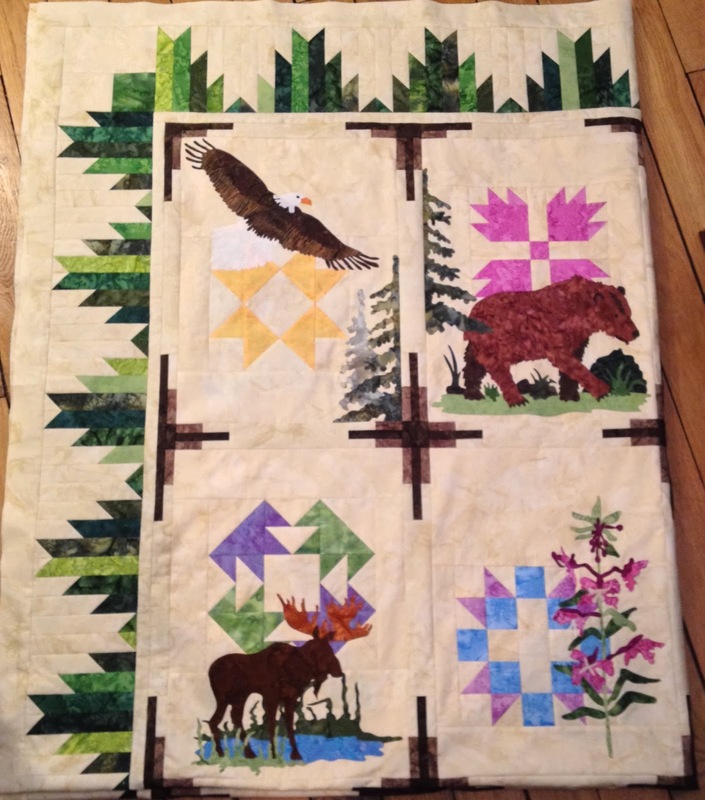 I hunkered down to finish my Alaska shop hop quilt. Done. I am three for three since my November arrival in Paris. A finished top each month...quite a pace! 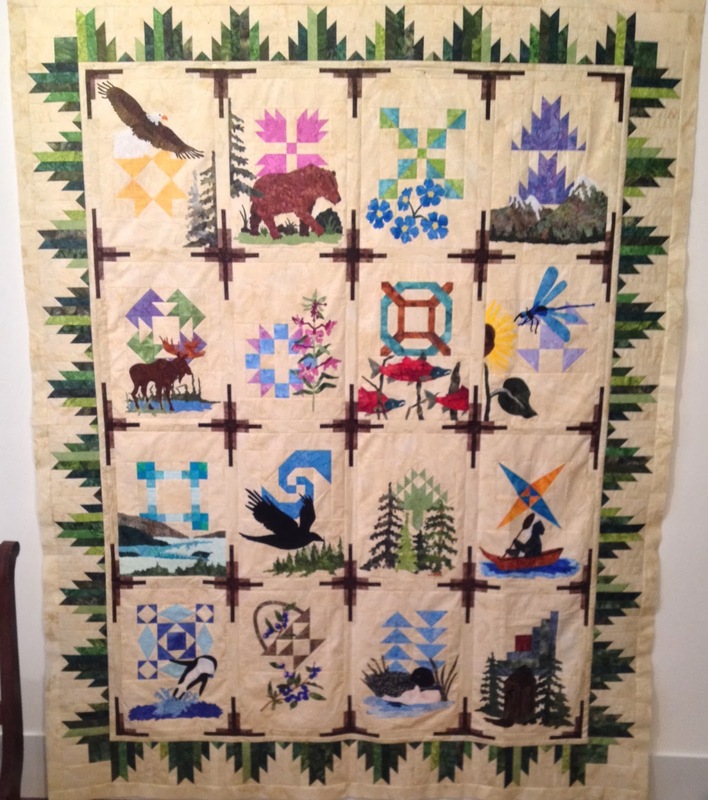 This quilt does have a name, "Northern Wilderness." This was a kit and I cut out everything about four years ago. There are four borders...lots of opportunities to come up with different sizes than the pattern. The blocks with the sashing came out half an inch larger than the pattern dimensions so I only had to trim the first border down a quarter of an inch all around and I was good to go. What a relief! And for some reason, which of course I don't remember, I had cut the final border at 2" instead of 1 1/2" like the directions so in the end my quilt is 1/2" bigger than the pattern. Way to much talk about math! Once I start the borders I like to keep going all day until I get them done so I don't have to "remember" where I was at later date. I also finished two more ornaments...I really just had to tack all the components together last night. Looking at the photo...I am going to go back and stitch some dimension into them...I'll show you what I mean tomorrow. Today was a play-date for me and Christelle. I think I am a vintage machine hoarder in the making. How could I leave that poor machine to sit alone and unloved in a French thrift shop? Here's the new girl...she needs a name. Christelle and I got another great work out hauling this machine, which weighs 30 pounds, up and down all the stairs for our subway ride. We had to switch trains twice to get to my apartment. Even with a cart I could not have done it without another person. The Paris metro system is not handicap friendly! I feel for young mothers with strollers...I don't know how they do it! Here is the case...very good condition and with a key to lock it on...though you can't trust that lock! Here's my French manual. Christelle gave me a quick run through! On the back of the manual was a date, Friday 10 June, 1959...who knows what that is about? A power converter came with it but it gets very warm....hmmm...not so sure about that. Sabine works...she isn't gear driven but has a new belt that is a little loose...have to figure how to handle that problem! She needs some cleaning and oiling. Christelle tried to talk the thrift shop owner down on the price but since this was a return visit, this gal knew she had me! I went to take off the face plate for further inspection but realized I have no tools here in Paris...not even a screw driver. This living in two countries has its disadvantages sometimes! First thing Sunday morning...the ceiling light bulb in my sewing room burnt out...grrrr. Very few stores are open on Sundays in Paris...other than touristy clothing shops. No...I don't have spares. Every light fixture in our apartment takes a different kind of light bulb. You cannot believe how difficult it is for me to find the right light bulb sometimes! But I sewed all day anyway and felt like I was in a cave. It was worth it. I got all the sashing done on my Alaska shop hop top. Love this sashing design. Now I must make Delectable Mountain blocks to go around the outside. Lots of cutting ahead. I worked on some ornament components from a Bucilla kit. I wanted to show how I do embroidery work on small pieces sometimes...I don't cut them out until after I have embroidered them. Yesterday my husband actually suggested we go for a walk. I neglected to take my phone with the camera. Good news...hubby had his! We saw two Bernese Mountain Dogs walking toward us. The owner was a Swiss gal and of course she spoke English very well so we had a little visit. 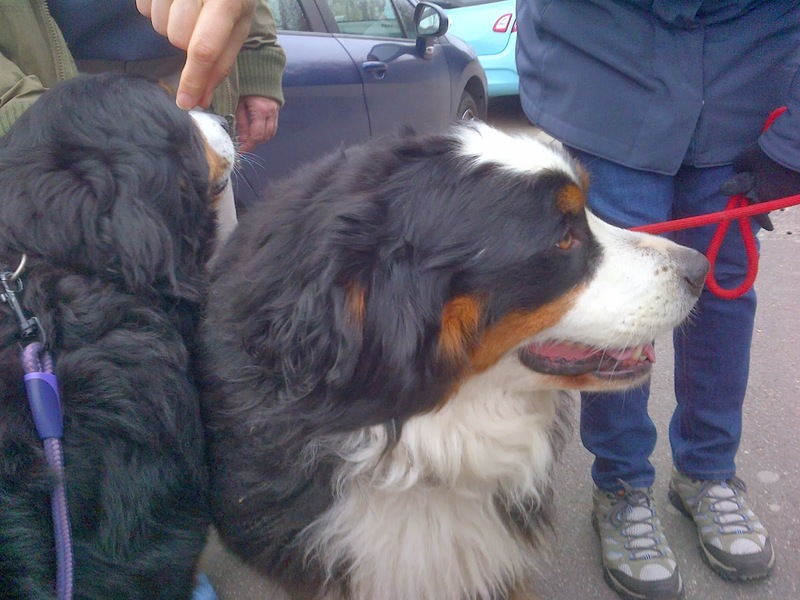 I tried to bring one of them home with me but Berners don't usually want to leave their people! 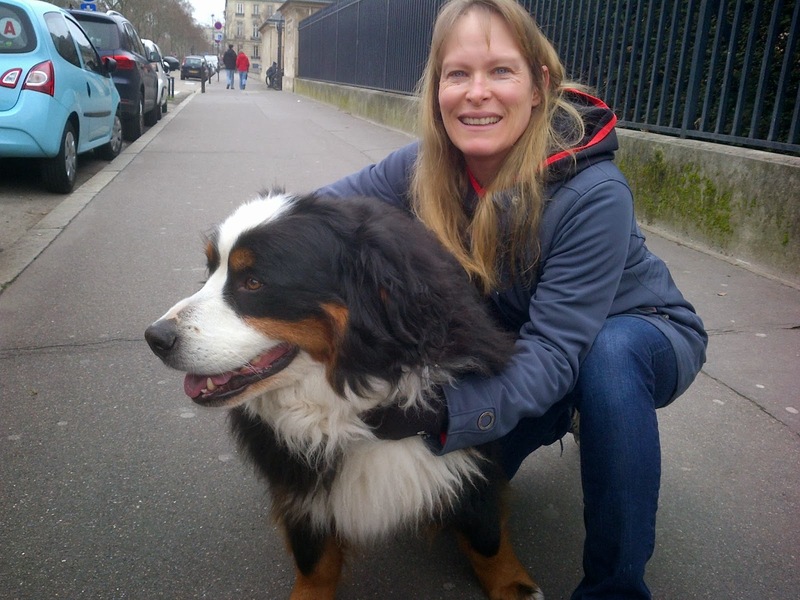 I just had to show there were two...one was reluctant to leave the side of her owner for a photo...that's exactly what I expect from a Berner...they really like their people and are not interested in strangers. I really wished I had a couple of dog treats in my pocket but I'm out of practice being around dogs and was unprepared. I'm linking up with BOMs Away and Design Wall Monday...see you there. I spent some time on the internet researching the machine I saw Friday in the thrift shop outside Paris...this one. I know nothing about vintage machines...but this looked like it was in good condition (along with a beautiful wooden case) for about $140 U.S. Here's what I discovered. From my photo, I was able to see the serial number and find out the model is a 15-91, gear driven (no belt) workhorse that was manufactured starting in 1935. It was called a farm wife's best friend in one article I read. It can sew very heavy fabrics and fine ones too. This one was made in Bonnieres, France. This model was manufactured into the 1950s but I don't know the exact year this machine was made. I found out from Christelle, France used 110V up until 1955 which is why the machine has the familiar plug. But I also read online that most often these machines require rewiring since wires only last so long. This machine was produced in great quantities so they are fairly common and this price is not a "deal." Like everything, the value is based on what a person is willing to pay! My current plan is to try and look at it again, if it is still available, when Christelle and I are on another adventure. She has a little collection of vintage machines and knows better than me what to look for so I would like her to come along to check it out a little further. The machine weighs 29 pounds so I will need to get a trolley to drag it back to my apartment. Here's an update on Christelle's Featherweight. Once plugged in the machine won't stop running! It might need a new foot pedal. The good news is there is a quilt shop in Paris that has a machine tech who is there on Tuesdays. I visited and blogged about this shop last year, Ines. And, as luck would have it, the thrift shop with the Singer 15-91, is open on Tuesdays. You can see...another Christelle and Debbie adventure is about to begin. My play-date with Christelle began at the Grand Palais for a jewelry exhibit of Cartier pieces. We were there bright and early at 9:45 a.m. for the museum's opening at 10 a.m. ...except I was waiting at the wrong place. It's not called the "GRAND" Palais for nothing! Thank goodness for cell phones. Once I got to the right place, we were third in line...third in line to buy tickets at the door. There were two other lines; a line for those who had bought tickets online for a reserved time and a line for groups. We didn't get to go right in at 10...a little bit more waiting...maybe 15 more minutes. Christelle has bought tickets online for exhibitions before and waited hours in line so you just never know what to expect. One thing I can say in admiration of Parisians is they appreciate art in all forms! The exhibit was purposely set up in a dark space with the jewelry showcased in brilliant light. The first stop was a huge case with a revolving stand of tiaras. The space was very crowded. There was a little bit of everything. Need a new tape measure and pincushion? Here's a set for you. These were tiny pieces. I'm glad I didn't see this dress before I got married...I would have wanted this one for that special day. Lots of pearls...love pearls. But the tiaras were the main attraction. So many beautiful ones...too bad a girl just doesn't have many occasions to wear them. 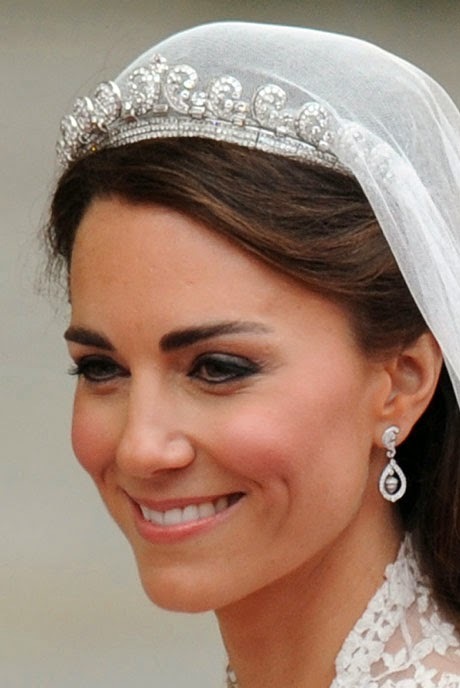 We got to see Kate's tiara from her wedding day to Prince William. We had a second exhibit to visit and this was a free one. No crowds here...we had the place to ourselves. It was an exhibit of silk fabrics designed in the Roaring Twenties by Prelle et Cie, a silk fabric manufacturer since 1752. If you have been to Versailles or the Biltmore estate in North Carolina, you've seen their fabrics. Like any good design space there were fabric samples from all eras on hand to view. The prices we saw ranged from $235 to $525 Euros per meter. And of course...if you meet the minimums you can have a special run of a pattern and colorway done just for you! There are a lot options, as you can look at woven patterns designed from 1752 to the present. Might take you a few days to go through those! At this point we had done a lot of walking. We like walking...the metro is noisy so it is much easier to have a conversation while walking. But it was time to get to the real fun. Christelle has a friend with a nose for thrift shopping. She found a white Featherweight on a French version of Craig's list. It was close...on the outskirts of Paris. I think it had just been listed the previous night so we couldn't dally! We definitely needed a break from walking so after grabbing a latte from Starbucks (Christelle knows coffee is my primary fuel) we hopped on the metro and took the number 11 to the end of the line, Mairie Des Lilas. A nice little suburb. But no option now for transportation except walking. No problem. The Featherweight owner assured Christelle she was close to the metro stop. Even with our nonstop conversation if felt like a long walk. We hit the town's center where we saw a lovely church. While Christelle checked out her google map ap (I love smart phones!) I headed to the church's cemetery and saw a different view of Paris. We were on the north-eastern outskirts of Paris. No Eiffel tower in site. Good news...we were close. We overshot a turn by only a block. Here's our final destination. Five feet into the doorway I wrenched Christelle's arm to show her this machine hiding under a table. She even had an American plug! This really kills me now to look at it again...$100 Euros and she stayed there. She was much too heavy to carry home. (I feel like such a weakling now!) I know everyone is going to be commenting about what an idiot I was to leave this gem behind! She had a beautiful cover too!!!! Idiot!!!! First impression...she is in excellent condition. Plugged her in and she purred! Here is what little we know of the machine's history. The thrift shop owner got her for almost nothing. She bought a load of crap from an estate sale and this beauty was in the mix. The machine looks brand new! The box was in fabulous condition. The bobbin case was present though there was a nest of thread in it. I'll update you on the cleaning process when Christelle gets her all spiffed up. Bonnie Hunter would be so proud of this discovery! And...this is not Christelle's first "Bonnie worthy" expedition. I'll have to share her Elna Grasshopper someday...Bonnie's already showed it on her blog! Another great outing...can't wait for the next! All the top-stitching on the fusible applique is done!!! I have re-arranged the blocks...looking for the final layout. Looks like I cut out all the sashing and border pieces...years ago! Sure hope I got it right...no extra fabric in the storage box. I actually cooked a big meal last night which took up most of my evening but I did finish a few candy canes to add to my ornaments. We watched the movie, "The Prestige." It's about two rival magicians during the Victorian age. I was loving the movie until the end. I wanted and expected a logical answer...like an Houdini trick. Not the case. Guess I won't say anything else to spoil the ending. Christelle and I are meeting up to visit a couple of exhibits around Paris today. I always look forward to our outings! I survived another French bureaucratic experience. The law firm handling my visa sent an American to walk me through my appointment. I would never have figured out how to get into the building (major security)...or how to get a number to wait in line (the number machine was unbelievably complicated)...or how to get out of the building (we had to exit from a completely different side of the building)...without him! We spent lots of time waiting so we got to talk about everything! American politics, French politics, British politics, Russian politics. My companion today entertained me greatly. He was a professor at Yale at one time. He is trying to get back into the academic world after a stint of trying to make a business venture work between Russia and France. Of course he speaks French (and Russian) very well and has lived in Europe for many years. He currently free-lances accompanying non-French for such government appointments as mine today. He's got another woman to meet this afternoon. A bit of a painful way to make money (sitting in waiting rooms all day) but I'm glad he was there today! He was a wonderful conversationalist...I think he has had a lot of practice! After we covered everything wrong in American and European politics we moved on to discussing food. I got his shopping recommendations...he lives near us so he had some good ideas for me. There is an American food store, "Thanksgiving," that sells canned black beans...I miss those. We have some dried black beans we brought back to Paris but I must think way ahead to prepare those. I am used to grabbing a can of black beans at the last minute and making a meal for myself. I also learned that there are actually laws about stores being closed on Sundays...just like blue laws some states used to have for the same thing. Of course there are exceptions which is what confuses me so much! All my "local" grocery stores are closed on Sundays. Since produce has such a short shelf life here it can be a great inconvenience. Then add to it that many local restaurants are closed on Sundays and Mondays. And to top off my appointment...I left without a new visa...10 days to process and mail to me. I could have an exciting re-entry to France when we go on a trip to the Canary Islands in February as my new French visa may not arrive before we leave...I'll worry about that another day! I find this all quite silly but I'm sure non-Americans feel just the same way dealing with the U.S. system. I'm close enough now to start thinking about putting the blocks together. I packed up this UFO two or three years ago. I had that initial panic when I started looking for the fabrics for the sashings and border...I saw my notes about green 1895 batik colors...what did this mean? There were blanks...was I still working on getting greens? I dug deeper in the box and was relieved to find the 36, 6 1/2-inch squares cut and ready to go...I'm so relieved! I think I have everything to finish putting the top together...keep your fingers crossed! And another little ornament started...calorie-free cupcake. Lots of sewing makes for boring blogging! I have four more blocks done...just four left and they are all partially completed. And I started another Bucilla ornament kit that is a companion to a stocking I have already finished. I got two gingerbread men ornaments done. I have a little outing tomorrow. I have to get finger-printed at a French police station for my visa. My husband's company pays for a service to walk us through the visa process so I will have help tomorrow if anything unexpected happens. I'm trying to get fusible web applique blocks top-stitched. A tedious task. Finished an audio book in two days while stitching. I listened to a Georgette Heyer book, "The Unknown Ajax." I know I read a few Heyer books as a teenager but I certainly don't remember any of them. This book was a fun listen...I will get to hear another book or two before I finish these blocks. Finished the felt ornaments from a Bucilla kit, "Snowmen and Polar Bears." I'm linking up with BOMs Away and Design Wall Monday. Good places to visit. I sometimes wonder if fusible web applique projects don't take just as long to complete as hand applique! I am experimenting with stitching batting behind the blocks and then trimming it. I won't know if this is a keeper technique until I quilt the finished top...hopefully this summer. Here's the back side after I trim away the excess batting. I am very uncomfortable stitching on my longarm through these fusible web areas so that's why I'm trying it this way. I have all the ornament bases completed on my latest kit...just need to add the little lights on all of them with black cording. We had a great meal with our friend the other night. He likes lamb and so do we! We ordered a roasted lamb shoulder with potatoes that is meant for two. It easily fed the three of us. After bringing out the pan, our waitress took it back to the kitchen where the meat was carved and returned to us plated. You can carve it up yourself if you choose. The piloting world is a small place so we had a great time catching up with our friend, Ron. The last time we saw him, he came to Alaska for some fishing...over ten years ago. Ron is on the left, Bryan on the right...two old F-16 pilots...they look pretty good!